BJP Manifesto 2019: The BJP also promised $300 billion (approximately Rs 20 lakh crore) for hard-pressed farmers and rural development as it went all out to stop voters being tempted by opposition parties in the world's biggest election that runs from Thursday until May 19. 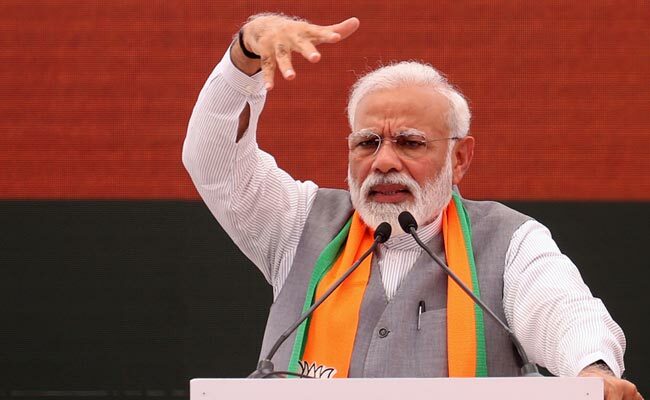 Prime Minister Narendra Modi on Monday vowed to spend more than $1.4 trillion (approximately Rs 97 lakh crore) on new infrastructure over five years to create much-needed jobs and to pursue a nationalist agenda if he wins an election that starts this week. The BJP also promised $300 billion (approximately Rs 20 lakh crore) for hard-pressed farmers and rural development as it went all out to stop voters being tempted by opposition parties in the world's biggest election that runs from Thursday until May 19. The BJP's big-spending manifesto was accompanied by promises to keep its Hindu bedrock behind the party that won a landslide victory in 2014 but has lost key state elections in recent months. "Nationalism is our inspiration and inclusion and good governance is our mantra," the prime minister said at the manifesto launch. Opinion polls have shown PM Modi remains very popular, but his government has come under fire from the opposition over its handling of the fast-growing economy, particularly accusations of failing to create jobs for the millions of young people coming on the labour market each year and the severe debts hitting farmers. Facing criticism from the Congress, the BJP said more than $1.4 trillion would be spent during the next five-year term if it wins. It promised metro trains for 50 cities and to double the national highway network. On top of the rural development, each farmer would get an annual handout of Rs 6,000. Thousands of farmers have killed themselves in recent years because of crippling debts. The party set 75 targets -- divided between the economy and its longstanding aim to transform society -- to be reached by 2022 when India marks its 75th anniversary of the end of British colonial rule. "It (the manifesto) is multi-layered and multi-dimensional because our society is very diverse. We can't have a one-size-fits-all kind of policy," PM Modi said. Last week, the Congress manifesto promised a Rs 72,000 payment to each of the poorest 250 million families. A Congress statement lambasted the BJP. "They had promised 20 million jobs every year. On the contrary the country has lost 4.7 million jobs," said Congress, which trails the BJP in opinion polls. "The youth are staring at a bleak future," it said.